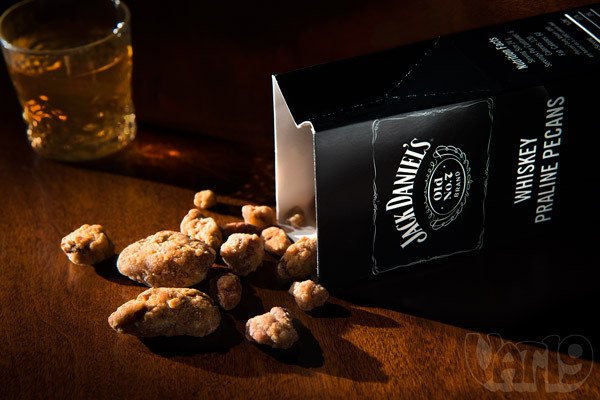 Gourmet praline pecans are combined with Jack Daniel's Whiskey to create a delicious and unique candy treat. 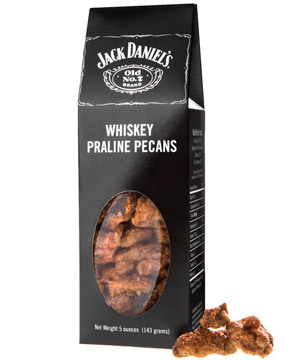 Cooked by the folks at the Indianola Pecan House (home of the original praline pecan), Jack Daniel's Whiskey Praline Pecans are made from fresh, plump pecans and a healthy splash of Old No. 7. These tasty treats are made in the USA and contain no alcohol as it is cooked off (leaving behind the distinctive Jack Daniel's flavor) in the baking process. Available in a 5 oz. box and a 14 oz. tin. 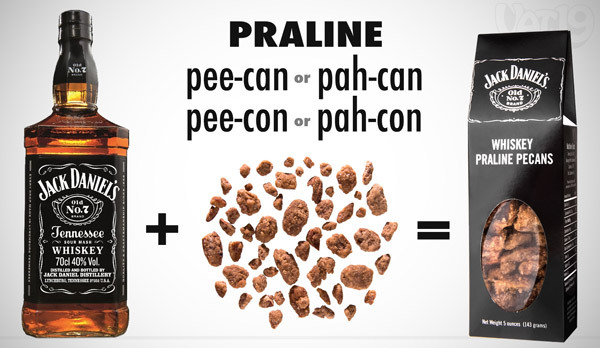 Depending on where you're from, you may call them pah-cons, pee-cans, or pee-cons. Well, however they're pronounced, pecans are delicious! Add some praline sugar powder, Jack Daniel's, and some serious confection prowess and you've got yourself Whiskey Praline Pecans! Delicious Whiskey Pralines combine real sugar, plump pecans, and a healthy splash of Jack. During the baking process, the alcohol content from the whiskey is cooked off. What remains, however, is the distinctive Jack Daniel's flavor along with the plumpest, freshest gourmet pecans. These suckers are goooood! Candy + Whiskey + Pecans?! Yes, indeed! Made by the creators of the Original Praline Pecan! 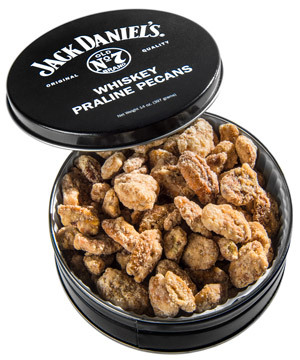 Jack Daniel's Whiskey Praline Pecans are made by the Indianola Pecan House in Mississippi. This company is the home of the original praline pecan. So, these guys know what they're doing. In joining forces with Jack Daniel's, they've created a memorable, unique, and delicious candy treat. 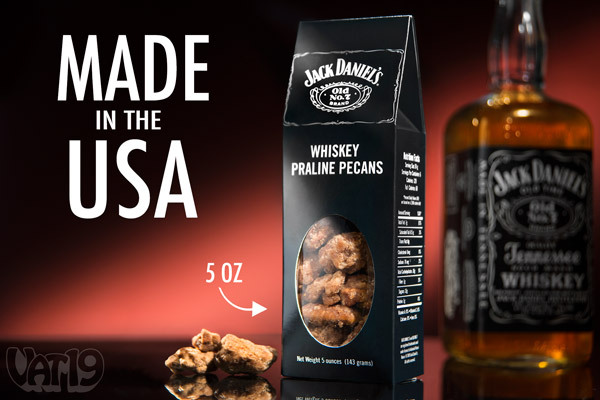 Jack Daniel's Whiskey Praline Pecans are made in the US by the Indianola Pecan House. Answer: Candy, y'all! Specifically, pralines refer to any confection made from nuts and sugar syrup. Answer: Pecans, Sugar (White & Brown), Non-dairy Creamer, Partially Hydrogenated Soybean Oil, Corn Syrup Solids, Sodium Caseinate, Dipotassium Phosphate, Mono & Diglycerides, Sodium Steroyl Lacrylate, Salt, Sodium Calcium Alginate, Artificial Flavor, Spice, Caramel Color, Maltodextrin, Jack Daniel's Whiskey, & Less than 2% Silicon Dioxide. Question: What is the allergy information? Answer: Jack Daniel's Whiskey Praline Pecans are packaged in a facility that handles peanuts, nuts, milk, and soy products. Question: Hit me with the nutrition facts. Answer: Answer: Serving Size = 24g (6 servings per 5 oz. package, 14 servings per 14 oz. package). Calories = 120, Fat Calories = 60; Total Fat = 7g, Saturated Fat = 0.5g; Sodium = 60mg; Cholesterol = 0mg; Total Carbohydrates = 18g, Fiber = 1g, Sugars = 13g; Protein = 1g. Question: Are they kosher or halal? Question: If I eat 15 bags, will I get drunk? Answer: No. The alcohol is cooked off during the baking process. You get the mellow and distinctive flavor of Jack Daniel's, the crunch of the pecan, and the sweetness of the praline in every bite. Yum! So, buy, buy, buy!